I’ve come across this gorgeous work by an artist who should be one of the major features in any textbook concerning not only the history of art, but also of design. Herbert Bayer was a true pioneer of modernism, not only in painting, but also in graphic design, architecture, and landscape architecture. 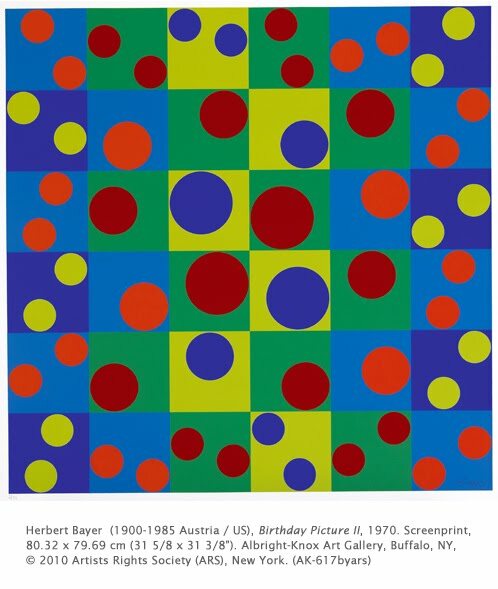 But, naturally, I’m drawn to his painting, especially since many of his works from the 1960s on are in the Op Art/Minimalism spectrum using fabulous color. Bayer is interesting not only because he was a pioneer modernist and designer, but also because of his tenure in the Bauhaus in Germany. 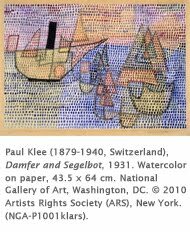 Out of the civil wars, ruined economy, and social strife that ensued in Germany after World War I (1914-1918), a revolution in art was born. Fertile artistic currents circulated through Europe after the war, especially in Berlin and Paris. The new school that was founded in Weimar, and directed by Walter Gropius (1883-1969) was called the Bauhaus (literally “buildhouse”). It was dedicated to the interdisciplinary combination of fine art and crafts, a search for universals of form, and a promotion of aesthetics in industrial production. Basically, art, architecture, and design merged to form a new modernist aesthetic. The Bauhaus was an amazingly vital and nurturing atmosphere for early twentieth modernism, boasting teachers such as Paul Klee (1879-1940), Vasily Kandinsky (1866-1944), László Moholy-Nagy (1895-1946), and Herbert Bayer. Bayer started out as a student, and after completing his training became the head of the newly founded school of print and advertising in the Dessau Bauhaus (1925). The Dessau Bauhaus issued their own books and magazines that espoused the modernist fusion of art and design. In 1928 Bayer left for Berlin to concentrate on his own work. He subsequently worked as a graphic designer and artistic director of an advertising agency, and became art director of Vogue magazine Paris. The entire time Bayer worked as a graphic designer, he still dedicated time to his painting, photography (and collage), and development of new fonts. His painting evolved from a brand of Surrealism, through Minimalism, into a type of chromatic Op Art. This painting comes from his Op Art period, although it harkens back to a theme that we see in his posters from the 1930s, the grid. I have a hard time deciding if the grid in his works was just a clean design choice, or was it influenced by Cubism of the early 20th century. Compare Bayer’s grids with the paintings of Paul Klee in which he used tiny squares of color to form compositions. The comparison is interesting. This painting definitely has both Op Art and Minimalism possibilities, and, of course, the color is absolutely beautiful. Correlations to Davis programs: Explorations in Art Grade 4: 6.35; Explorations in Art Grade 5: 3.15, A Personal Journey; 7.1, A Global Pursuit: 4.2, 8.1; The Visual Experience: 5.3; Discovering Art History: 17.2. Excellent article and a great Bayer piece of work. Thanks!